Lee Rowan's stories of love that dares to speak its name! 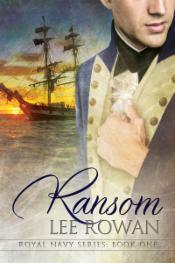 Beginning September 1, 2014, The Royal Navy series will be published by Dreamspinner .... and this is the cover for Ransom, by the inimitable Reese Dante. And here is the second volume, a SUPER DEAL - Winds of Change and Eye of the Storm will now be a single volume with a single price. I have requested and received the publication rights to Tangled Web back from Running Press. I am exploring self-publishing ebook options, but in the meantime I also have the original Running Press print edition available - please contact me about that, too. In the words of the immortal Dr Leonard McCoy -- paraphrased somewhat -- I'm a writer, not a web designer. Thank you for your interest in my books!